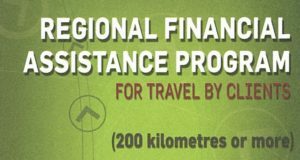 This financial assistance program aims to support patients in Gaspesie-Îles-de-la-Madeleine who, at their physician’s request, must travel long distances to receive care and services not available locally. Payment is granted as an allowance to help alleviatethe costs associated with travel and accomodation expenses. Linda Lemore-Brown Foundation provide financial aid to individuals afflicted with cancer who need to travel outside the region for treatment. To provide financial aid to individuals afflicted with cancer who need to travel outside our region for treatment. To act as a bilingual information center for our region. If you have any questions about applying for financial assistance, contact them by e-mail or call 1-888-939-3333.